This VIP experience includes one-way private transport and an extensive guided tour of Universal Studios Singapore with repeat priority access to at least eight amazing attractions as you are personally escorted throughout the theme park. Your full-day admission pass provides skip-the-line access to all attractions at the park (except for Amber Rock Climb) during operating hours on the day of your visit. After complimentary pickup from your hotel by private vehicle, meet your host at the studio and receive your VIP lanyard and commemorative pin. Enjoy light refreshments with a choice of coffee, tea or bottled water before you begin your 5-hour tour based on your favorite blockbuster films and television series. You’ll be immersed in seven entertaining zones, including Hollywood, New York, Sci-fi City, Ancient Egypt, Lost World, Far Far Away and Madagascar. 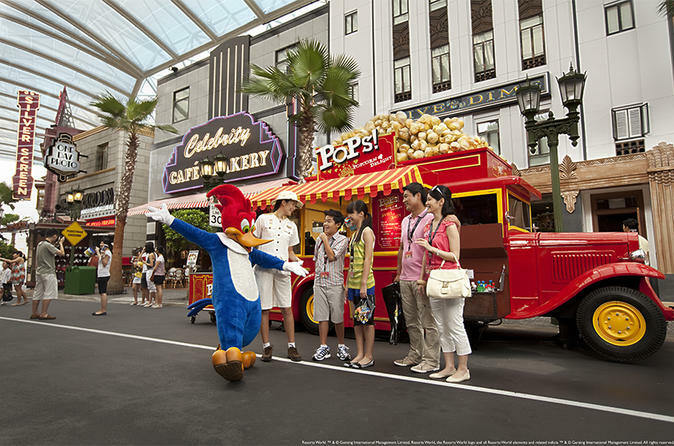 Along the way, you’ll feel like a celebrity with the opportunity for a private meet-and-greet and photo session with selected Universal Studios Singapore characters. Your host may introduce you to Marilyn Monroe or Woody Woodpecker™ along the legendary Hollywood Boulevard or Shrek and Princess Fiona in Far Far Away. Your VIP guide will take you to the park’s most popular rides and shows via exclusive VIP entrances so that you don’t have to wait in line. Experience the thrill of Jurassic Park™ Rapids Adventure, Madagascar: A Crate Adventure, Shrek 4-D Adventure and more as many times as you'd like! Before or after your tour, explore the vast park on your own, skipping the queues on rides (one line skip allowed per ride) and getting the best seats in the house for every show. Your $25 lunch voucher can be used at any restaurant or food cart in the park, and you’ll receive a 10% discount on selected merchandise at any retail outlet at Universal Studios Singapore. Anyone who has ever been to any theme park this is a must. Viators communication was awesome and all the people involved with our tour to Universal studio and #39;s were great. We must thank our wonderful guide Jimmy for all his assistance. Fantastic tour, 6 hours nonstop action rides without the 60-90 minute usual wait. The big disappointment is the price. We discovered from others on the same tour that they had paid 150S per person less for exactly the same tour by booking directly off Universal's website. It pays to do your research! Awesome tour. This was a bit pricey, but worth every dollar. We were able to see everything in the park, do every ride and see all the shows we wanted without standing in line. The tour guide was very good and the experience was outstanding. I recommend this for couples or families, it is well worth the cost and will make for great memories. Totally worth doing if you want to see everthing and do everything and not have to wait or queue. Our Universal Studios Guide was Desmond and he loved what he does - he was fun, informative and very obliging. We went on every ride and saw things that you don't see on unguided visits. Lunch was included at your choice of applicable venues. We chose Hollywood Chinese and had a very nice lunch. You get to watch the Waterworld action display from the VIP box up the back - great viewing position. Once the tour is over, you can re-access any ride etc with your lanyard ticket direct to Express Entry and avoid the pong queues. HINT - go weekdays an not holidays and it is much less crowded and far more enjoyable. IMHO this is the only way to really do Universal Studios in a day. Bit more expensive, but if time is money..you save a bucket load. Thanks Desmond - you were absolutely fantastic and made our day an excellent one.